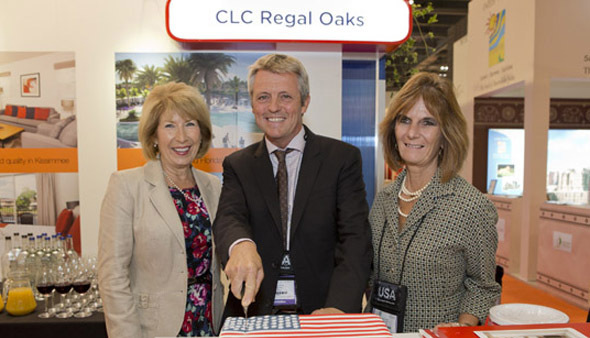 CLC World Resorts & Hotels continues to embrace the American Dream and showcased its CLC Regal Oaks resort, near Kissimmee, Florida, at this year’s World Travel Market, the leading global event for the travel industry held in London last week. Latest developments at CLC Regal Oaks were on show as part of the Brand USA pavilion. The resort, the company’s newest property, is located less than 6 miles from Disney® and within walking distance of Kissimmee Old Town. Already it has been receiving positive reviews from guests and will be formally opened in spring 2015. CLC World celebrity ambassador Jennie Bond made a VIP appearance on the stand at WTM, welcoming guests and chatting with UK tour operators and trade press about the quality she experiences when staying at the company’s worldwide resorts. Jennie joined CLC World’s Laura Sherman, Resorts Management Director in the US and Lucien Le Moing, CLC World Product and Business Development Manager in the ceremonial cutting of a cake featuring the Stars and Stripes and resort name at a CLC World reception, attended by travel trade and consumer media and tour operators. They later joined the US Embassy representative Chrystal Denys, Commercial Specialist, and other leading dignitaries for a Brand USA reception. CLC Regal Oaks neighbours Old Town, Kissimmee, and is surrounded on other sides by greenery. The resort comprises 2, 3 and 4 bedroom townhouses, complemented by resort facilities that include a free-form swimming pool with sun decks that extend out over a lake, a showpiece clubhouse with restaurant, coffee shop, gym, games room, controlled gate house and more. It is a sister resort to CLC World’s first foray in the US, CLC Encantada resort, which is also located in Kissimmee.